Contact us anytime at customerRFQ@marshbellofram.com that we can be of assistance. Marsh Bellofram is a world class instrumentation manufacturer, with powerful product support, and near flawless distribution. Our mission is to engage the current and future needs of our customers with swift, professional service while providing the highest quality instrumentation products at the most competitive prices. Marsh Instrument Company was originally established in 1865 in Skokie, Illinois, as the James P. Marsh Company. Marsh was acquired in 1988 by Desco and relocated to Hastings, Nebraska to share operations with Desco’s Marshalltown Instruments. Marshalltown had been founded in 1918 in Marshalltown, Iowa. The two gauge and thermometer product lines were consolidated by November, 1993 into a Marsh/Marshalltown product line. In 1950 it was becoming increasingly apparent that designers of machines, instruments and automotive vehicles could not continue to live with the serious problems of friction and leakage which had long been associated with O-rings, chevron seals, cup packings, metal bellows and other conventional seals. At that time, Bellofram initiated what proved to be a five-year program of intensive research and development, to produce a frictionless and leak-proof rolling seal that would handle pressures, temperatures and stroke lengths over an extremely wide range. At the end of the five years, the company had produced a complete line of rolling seal diaphragms for a broad variety of industrial needs. The immediate, wide-spread acceptance of this successful new principle of sealing resulted in rapid company growth, and in 1957 Bellofram erected facilities in Burlington, Massachusetts. John Taplin, the founder and original owner of Bellofram, designed air cylinders, air regulators, gauge protectors (diaphragm seals), and other pneumatic and hydraulic devices using his diaphragms. In the early 1980’s Rexnord purchased Bellofram, and then in 1986 sold Bellofram to the Desco Corporation of Columbus, Ohio. Desco moved Bellofram from its plants in Pelham, New Hampshire and Burlington, Massachusetts to a new, modern facility in Newell, WV, designed, constructed and fully integrated specifically for the high-volume, high-precision manufacture of elastomer products. 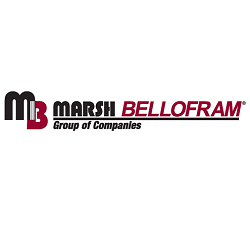 Marsh and Bellofram, sister companies of the Desco Corporation, were combined into Marsh Bellofram in January 1995. Marsh Bellofram Corporation has its headquarters in Newell, West Virginia, about 25 miles west of Pittsburgh, Pennsylvania in the northeastern United States. The building has been carefully laid out to ensure the smooth, efficient flow of materials and work in process. Its complement of tools, automatic machinery and specialized processing and production equipment is one of the most extensive in the industry. With significant resources of technical personnel and skilled production workers, the Newell facility is well suited to the economical manufacture of highly engineered elastomeric products and precision regulators. In 2010, the Marsh Bellofram Group of Companies acquired the Milton Silicones Division of MTI Specialty Silicones, Inc., a long-time compound developer and producer of specialty silicone products, whose business operations were based in Toronto, Canada. At the time of this acquisition, the technology manufactured by MTI Specialty Silicones, Inc., was an amalgamation of the legacy product lines of two industry leading manufacturers: Mold Ex, Inc., of Milton, Florida, USA; and the silicones division of Groendyk Manufacturing Company of Buchanan, Virginia, USA. With this new technology acquisition, MTI company operations in Milton, Florida transferred to Marsh Bellofram global corporate headquarters in Newell, West Virginia, USA, with many of the most popular product lines from Groendyk, Mold Ex, and MTI continuing to grow and develop within the newly formed Bellofram Silicones division of Marsh Bellofram. Bellofram Silicones, Inc., is pleased to serve our customers in the design, production, and distribution of specialty rubber products, as well as several complementary instrumentation product lines. Our materials are designed for high performance and longevity in temperature extremes and compression set sensitive applications. A wide range of durometers in solid silicone and hardness ranges in sponge make our products the material of choice for aerospace, transportation, food service, lighting and industrial sectors. Established in 1920 with a patent for an automatic valve-regulator, ATC began its operations in Brooklyn, NY as the Automatic Temperature Control Company. This entry into the field of automation of industry led the company to produce many other automatic controls needed by modern manufacturers. The word “AUTOMATION” as a designation of this field was not even coined until a quarter of a century later. During the 1930’s, ATC developed a line of industrial timers, which were used to control the sequence of operation of machines. Many of the early sales were not only made to the Brown Instrument Company of Philadelphia, which eventually became part of Honeywell, but for several years Brown Instrument handled the sales for ATC. The company changed its name in 1957 to Automatic Timing & Controls, which more clearly designates its major products in the general field of automation. In 1979, ATC introduced the Model 365 Long Ranger Timer as the world’s first microprocessor-based industrial timer. Updated with technology, the 365 still today maintains a position as the industry workhorse timer. Today, ATC continues its 85 year history of designing and manufacturing reliable, accurate timing and control devices at its plant in Newell, WV.